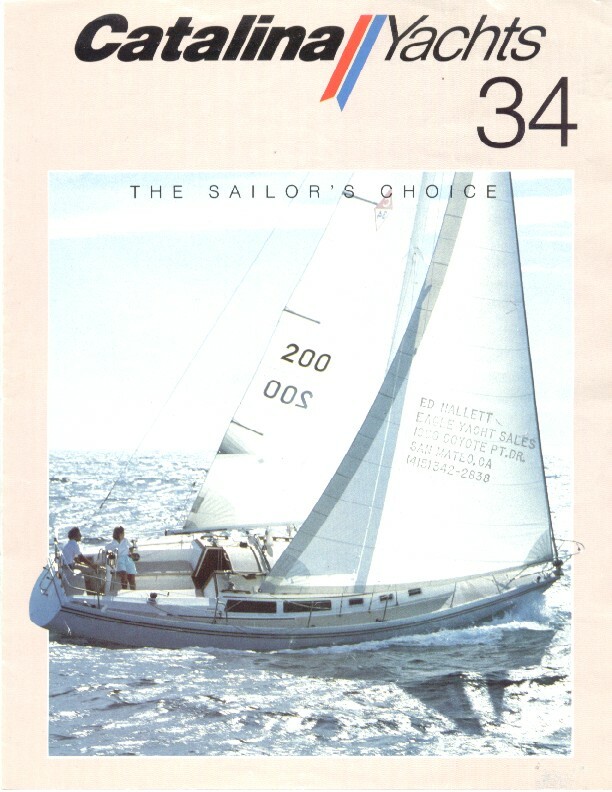 The C-34 has evolved since 1986 always having the choices of the tall (approximately 52 feet) or the standard (approximately 50 feet) mast and the wing (4 feet 3 inch) or fin (5 feet 7 inch) keel. 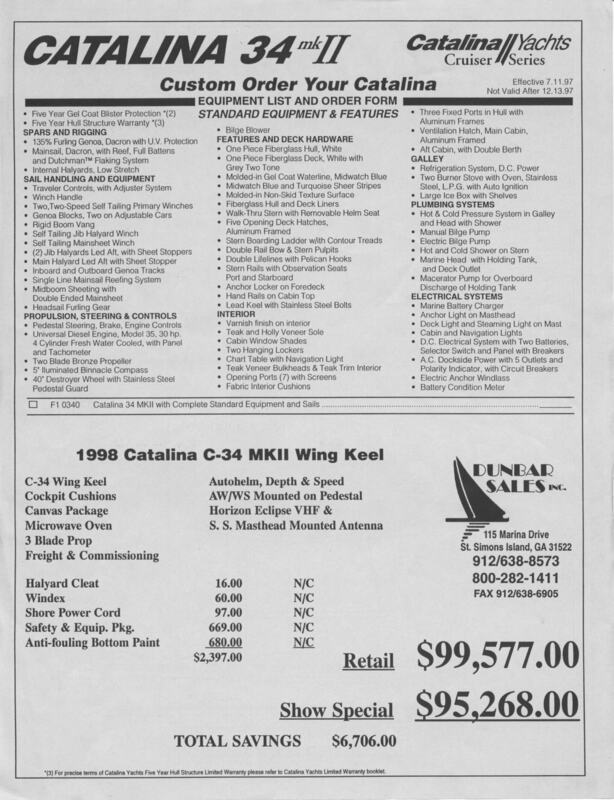 Check out the original order form and price list. 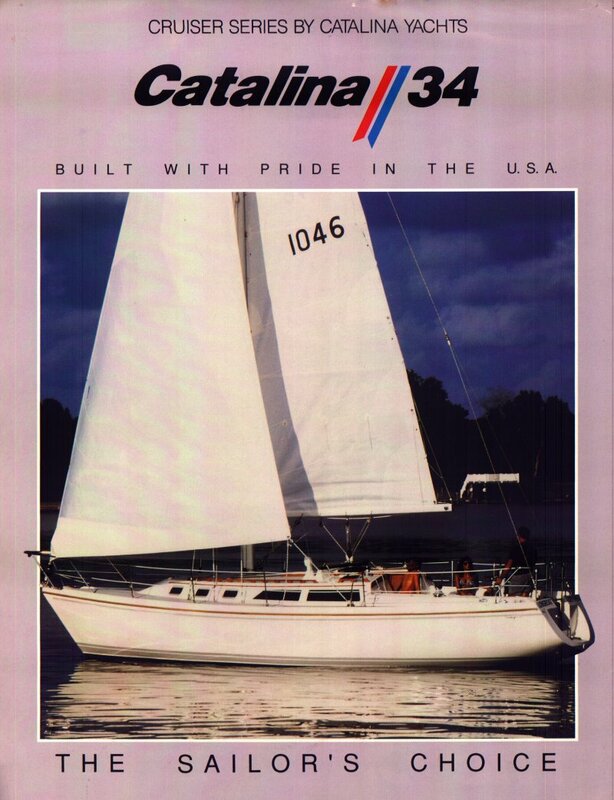 I bought my Catalina 34 because I became convinced that the evolution has not been change for change sake, it has been in response to recommendations from C-34 owners. 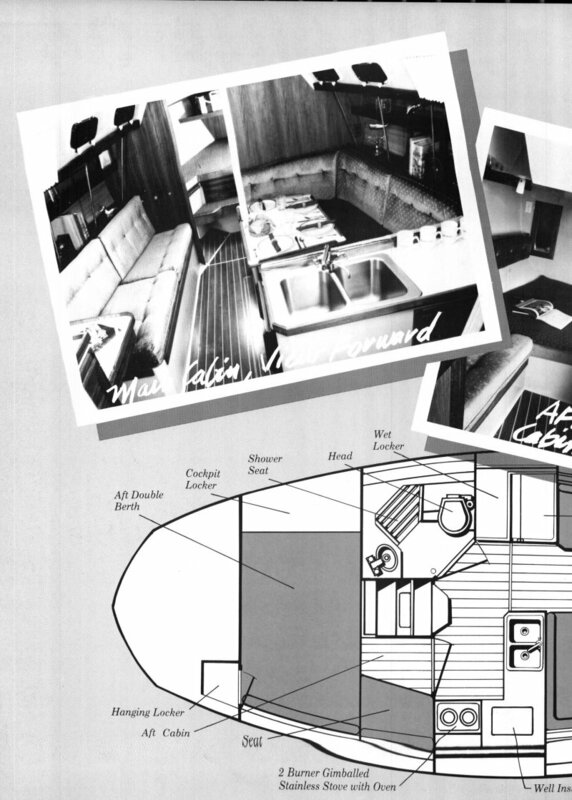 It continues in small ways with ongoing improvements based on contributions from “owners like you” from year to year. 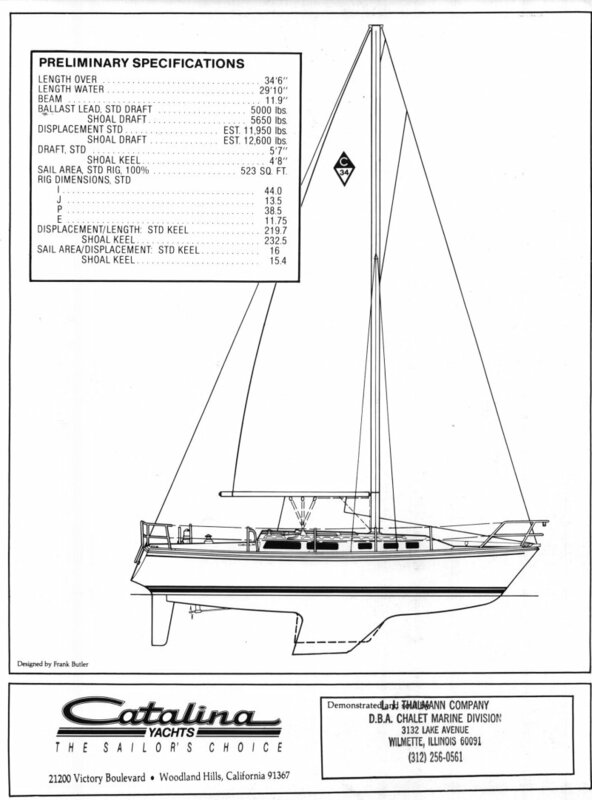 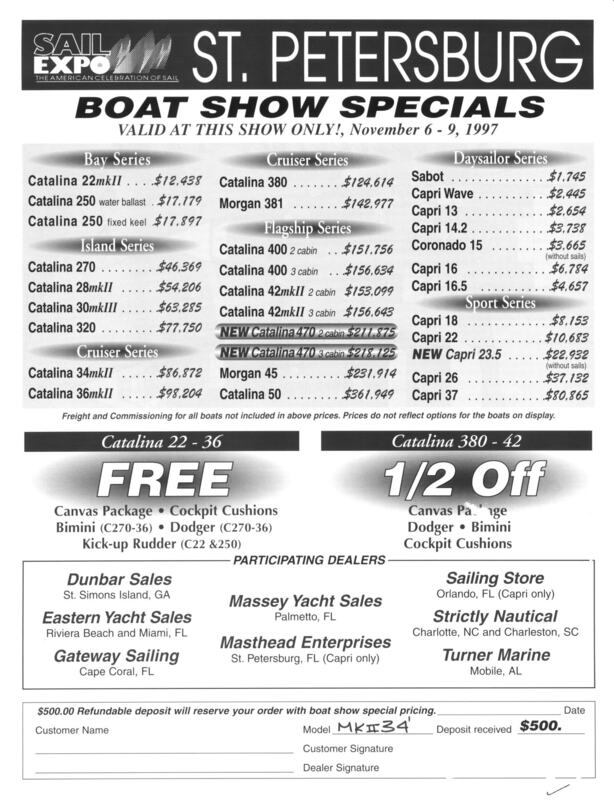 The early 1985 and 1986 hulls have an option for a keel or deck stepped mast with a Universal 25 (21HP) diesel engine. 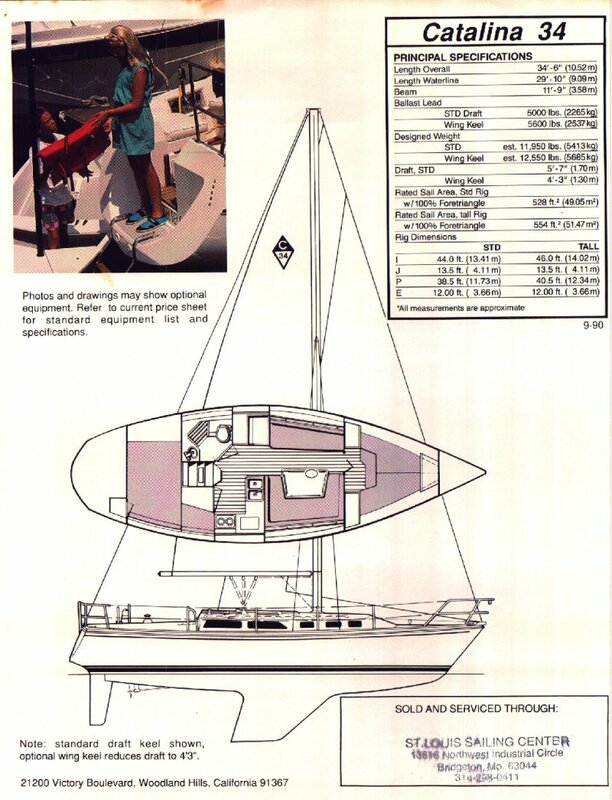 1987 Mast step options continue and larger engine. 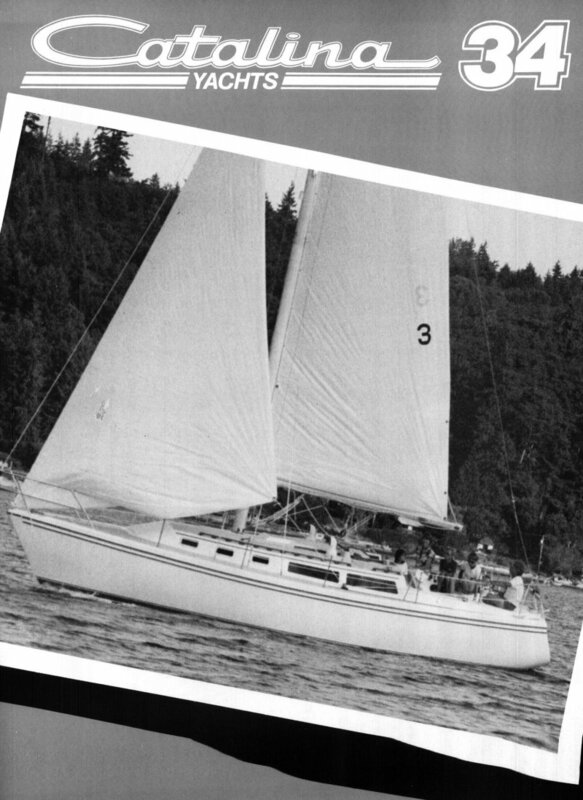 The 1987 through 1990 hulls incorporated a Universal 25XP (23 HP) engine. 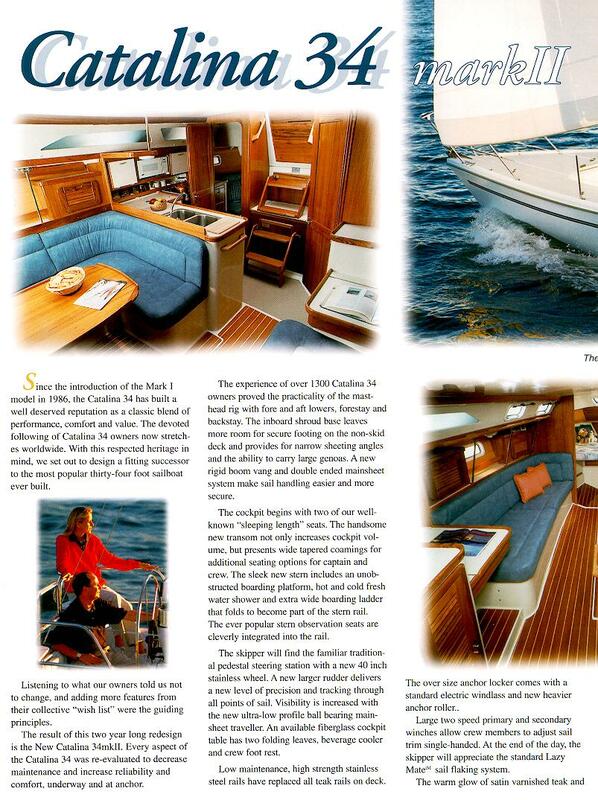 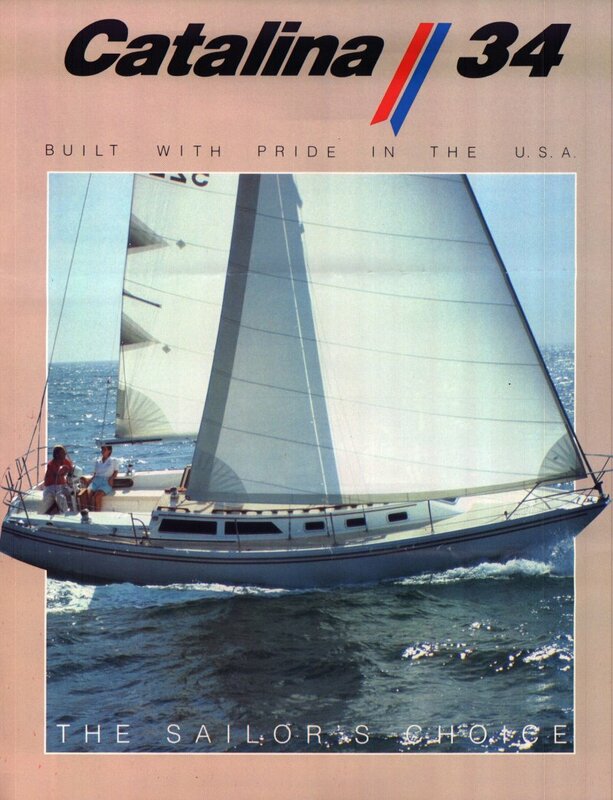 1990-91 The hull incorporated a walk-through transom and a Universal M35 (30 HP). 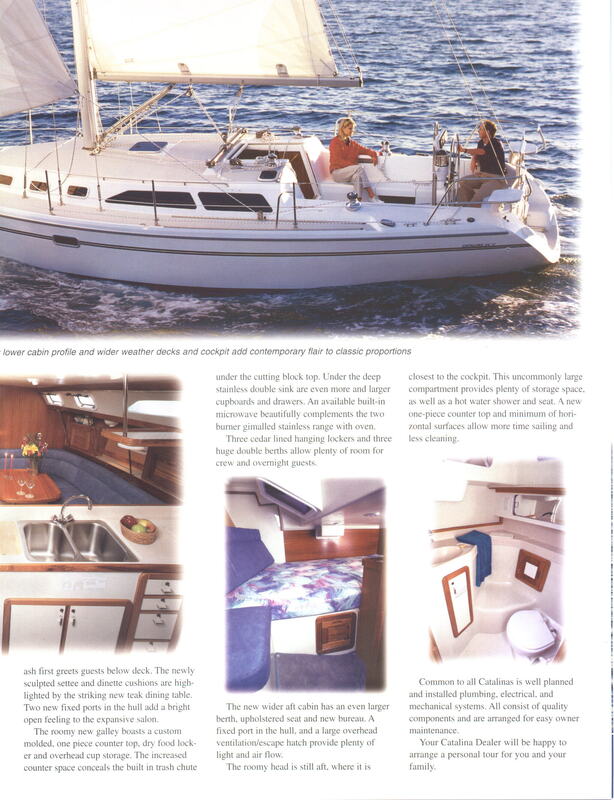 Gradually, many changes were incorporated that were later to characterize the Mark II: for example, the walk-through transom was added on 11/30/89, an aft deck shower on 3/6/90, and a single-line reef on 12/10/91. 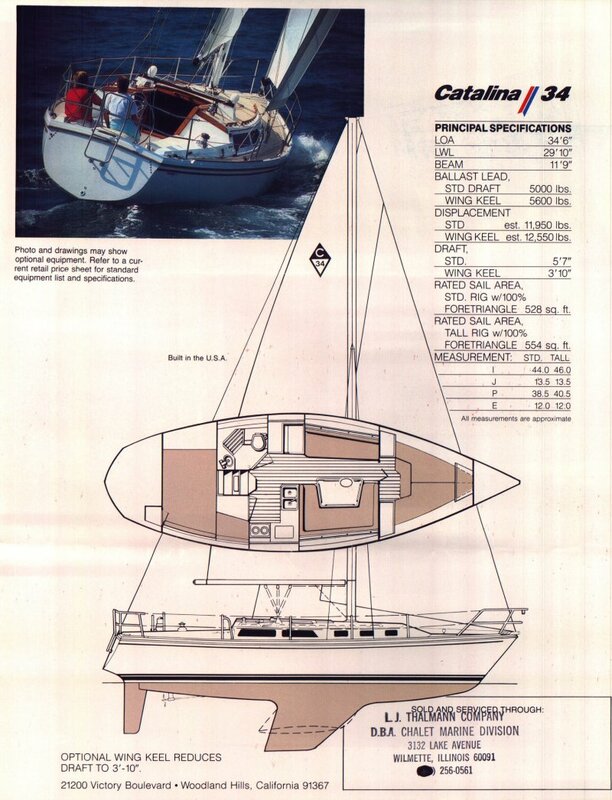 The last Mark I models look very much like Mark IIs. 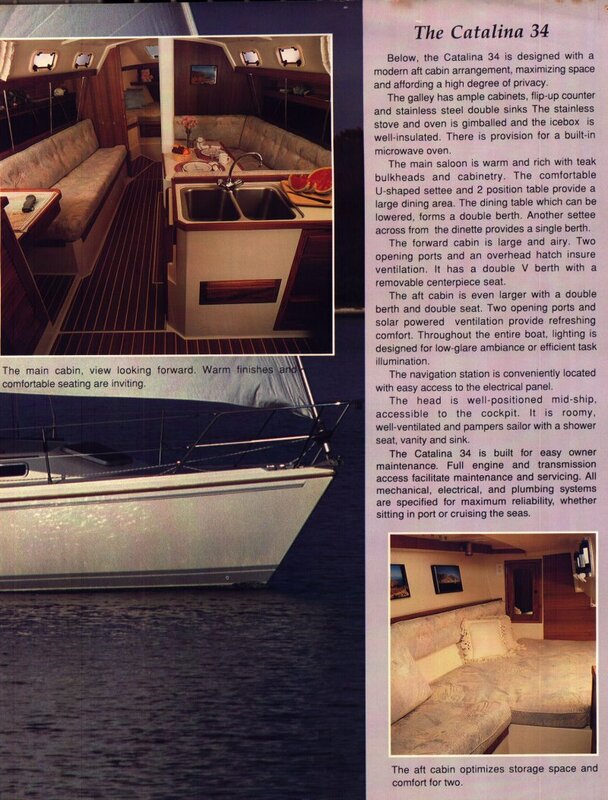 1995 Only two C34s produced this year in anticipation of new Mark II model. 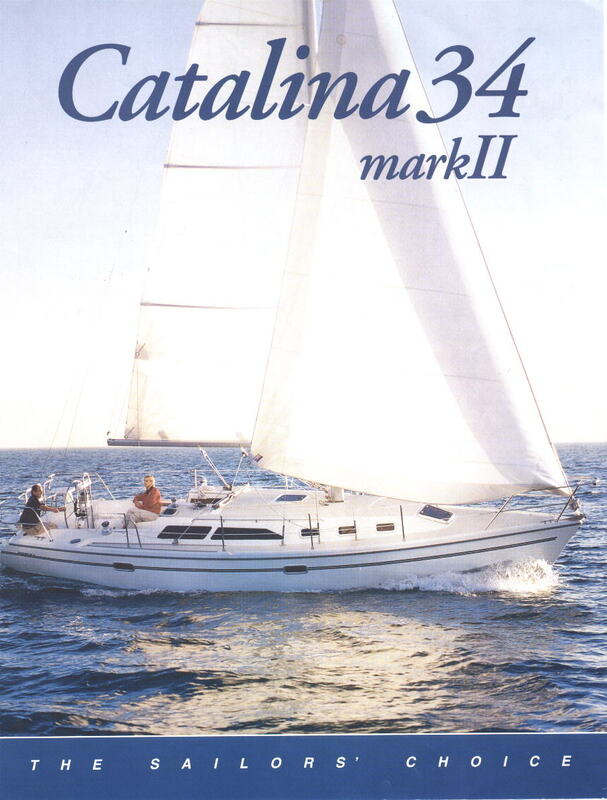 Mark 1 molds reportedly lost in a fire at the California plant. 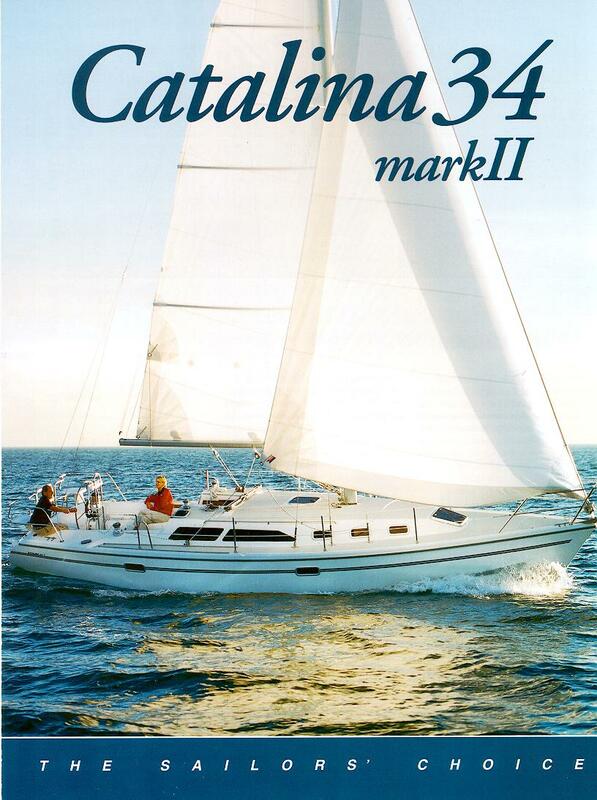 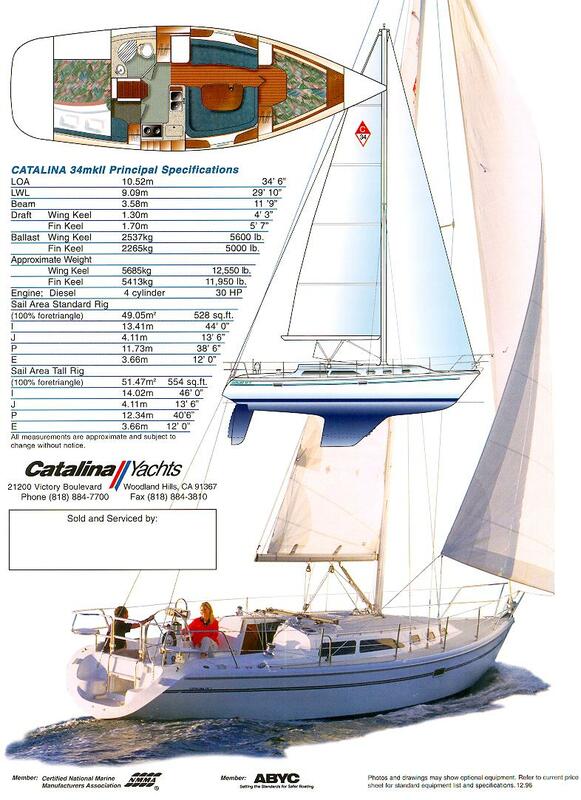 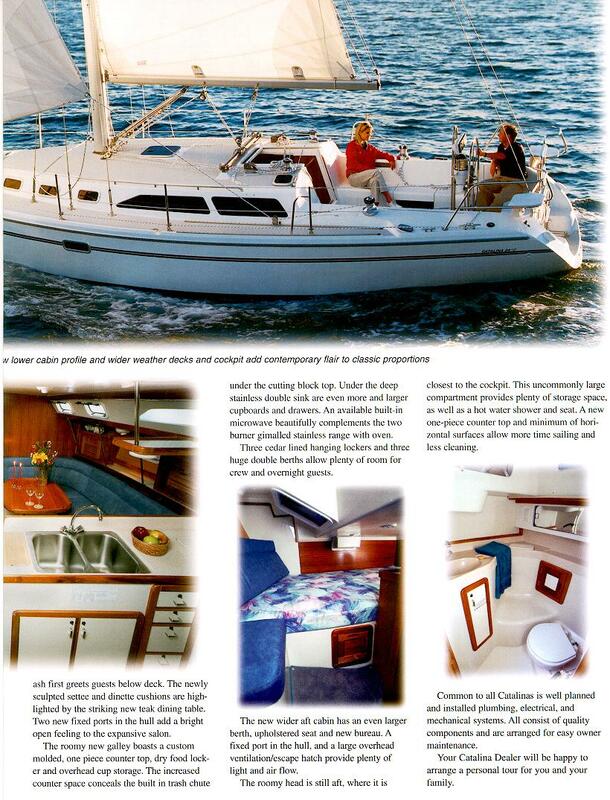 1996 Catalina 34 Mark II. 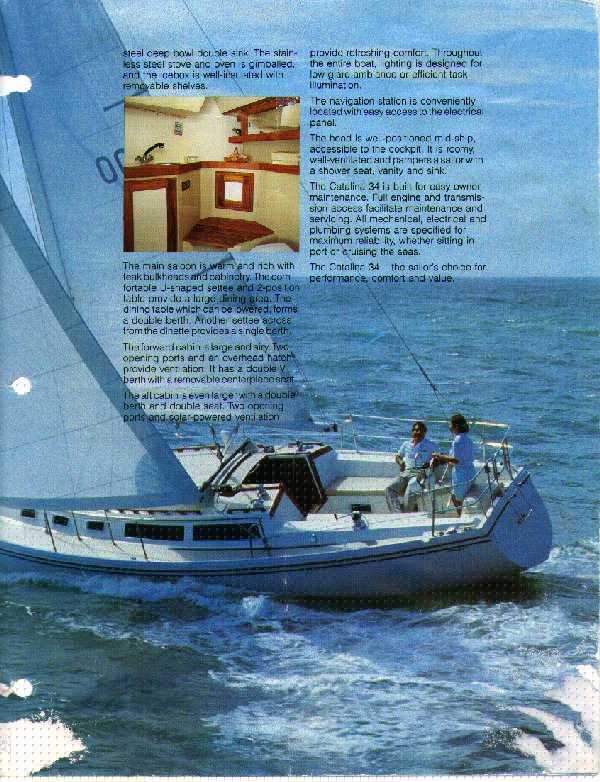 The MkII has a deck stepped mast (no option available any more) with a redesigned hull which is noticeably beamier in the cockpit and transom areas. 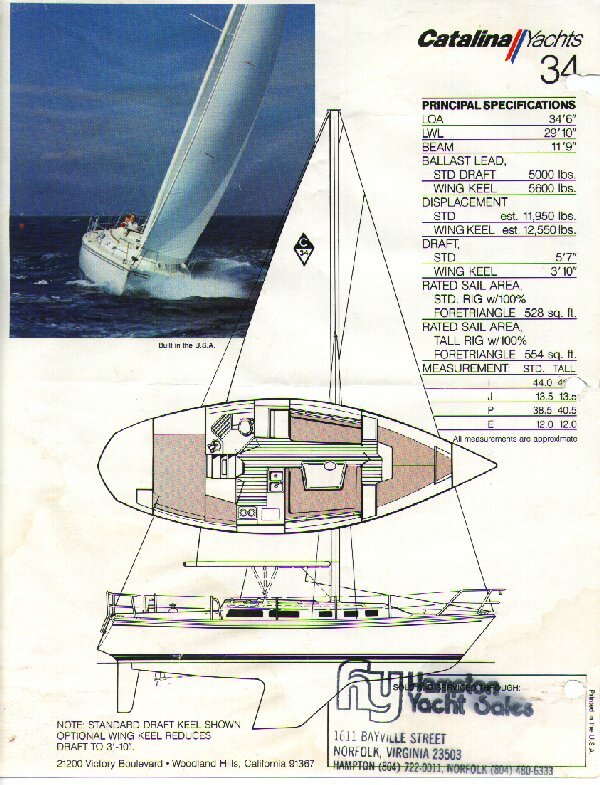 SAME underwater hull to allow one design racing. 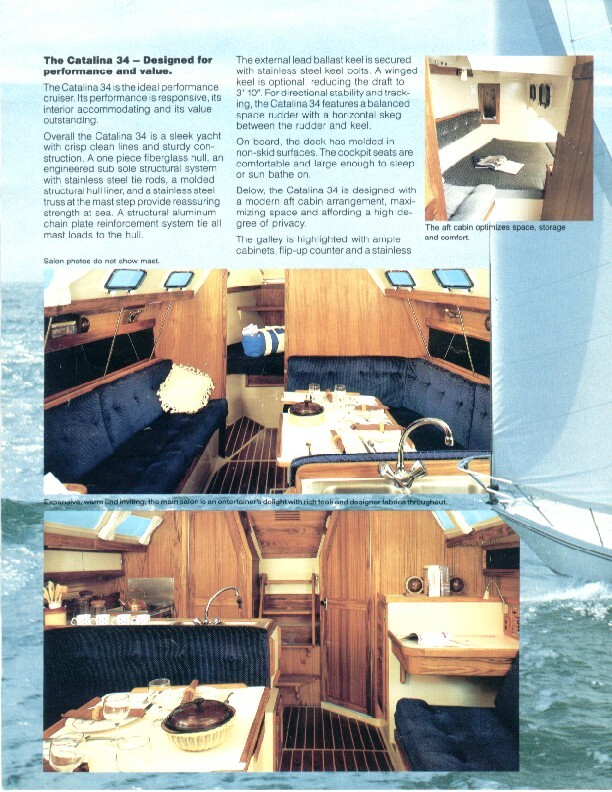 New features Wider above the waterline at the stern making the cockpit wider. 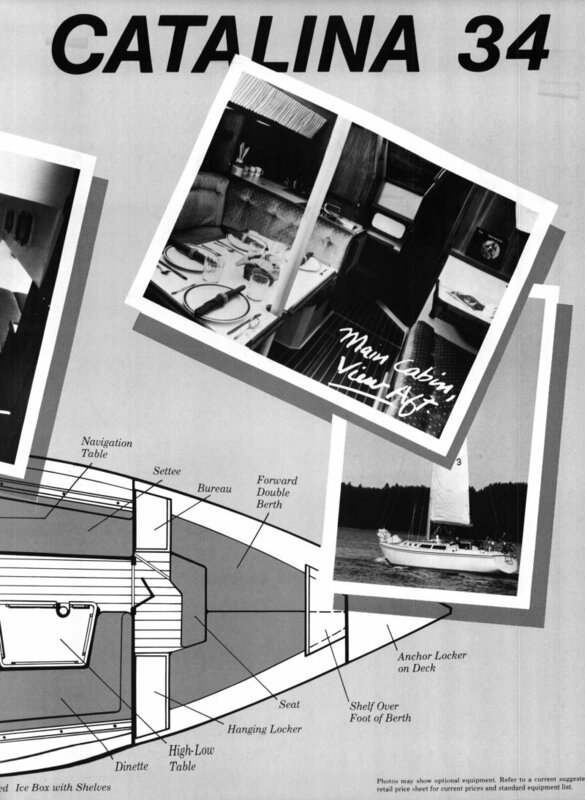 Seats on the stern pulpit. 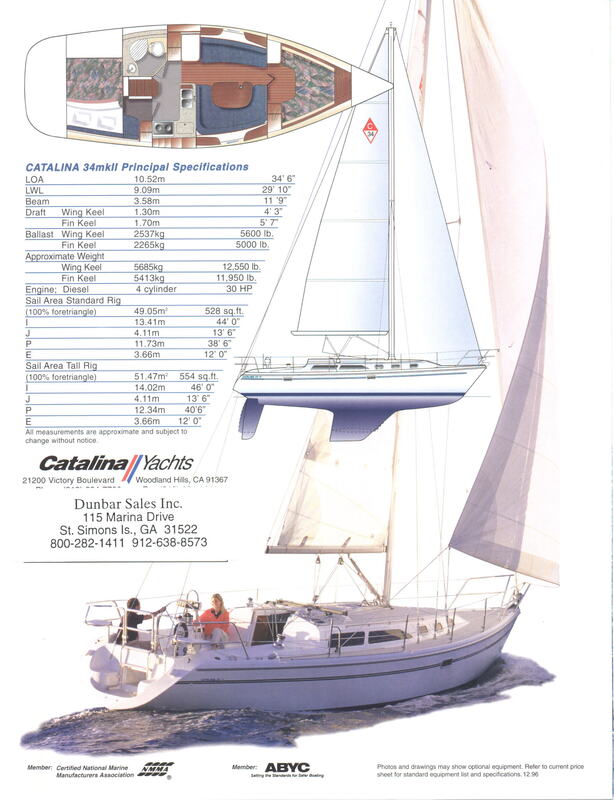 Deck stepped mast with compression post in lieu of keel stepped option. 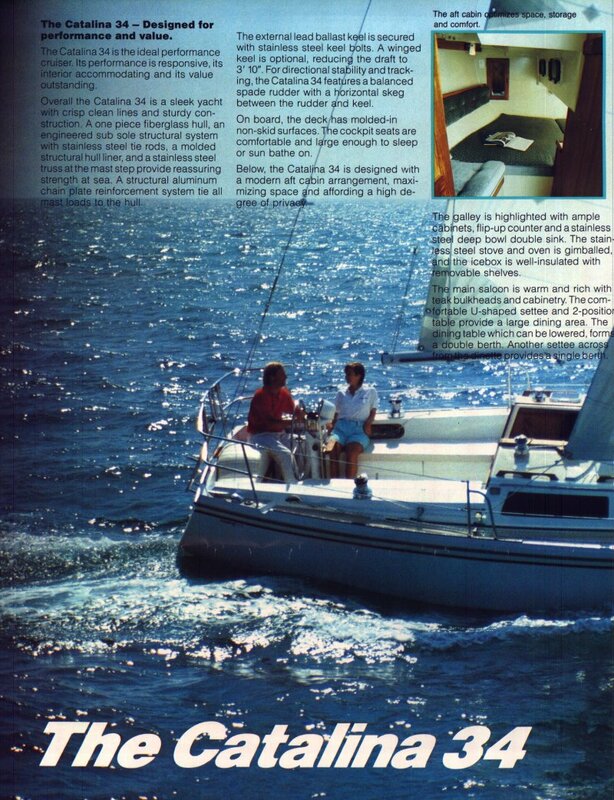 New head mold for better drainage and easier cleanup. 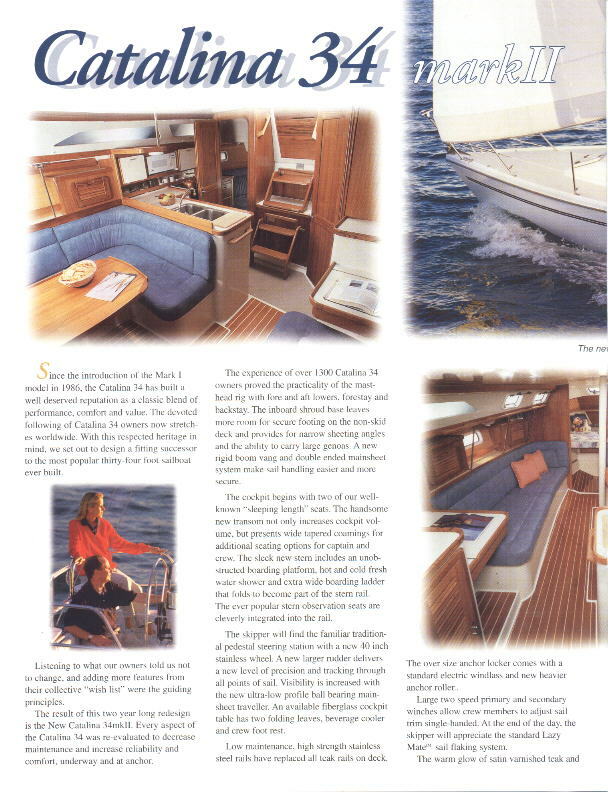 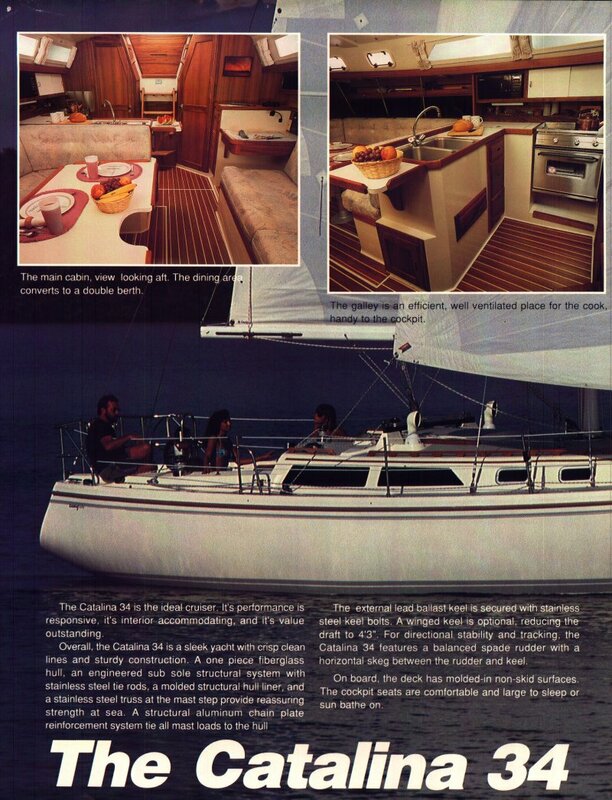 Revised deck mold, elimination of dorade vents, lower traveler, revised companionway hatch and slides, elimination of virtually all topside teak, relocation of engine control panel to steering pedestal, fixed cockpit table (option), new interior cabinetry with louvered teak fronts in lieu of sliding black Plexiglas, addition of hanging locker in aft cabin, modified lockers in the V berth, revised galley counter (Corian style) with trash bin and elimination of fold-up counter extension, rubber flooring in galley area, revised and relocated electrical panel.